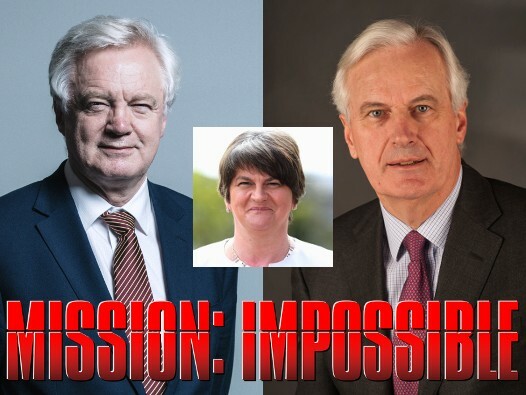 The British Gazette » Brexit: Mission Impossible. In our article yesterday (http://www.british-gazette.co.uk/2017/10/11/brexit-letting-the-cat-out-of-the-bag/), we outlined the way this Tory government was thinking in relation to sabotaging Brexit by surreptitiously working towards asking the EU to allow the UK to rescind it’s Article 50 notification. Looking back after the dust has settled it is likely that this outcome will be seen in retrospect as being inevitable after Madame Mayhem’s disastrous election result in 2017. This largely due to the party led by the lady in the centre of today’s complied image: Arlene Foster. Mrs Foster is all altogether tougher and stronger character than Madame Mayhem. 1. No land border with the Irish Republic. In this she is also in agreement with Michelle O’Neill, the leader of Sinn Féin in Northern Ireland – probably one of the few things these two ladies have in common! 2. No distinctive customs status and therefore no customs or any other type of border between Northern Ireland and mainland Britain. Unfortunately for Madame Mayhem there are only TWO solutions that meet Mrs Foster’s criteria. 1. Remaining in the EEA and the EU’s Customs Union after Brexit. This reduces the UK to the status of dependent territory of the European Union! 2. Remaining in the European Union! Whilst these two outcomes will satisfy Mrs Foster, they most certainly wont satisfy such as Jacob Rhys-Mogg! Thus it was that in today’s performance of the Comedy of Errors [sorry, Brexit talks] in Brussels where Barnier and Dimwit Davis haven’t even agreed what they are going to disagree about, we saw Dimwit give a master class in meaningless waffle – to the understandable embarrassment of M. Barnier! What Madame has ordered Dimwit to do is to present an ebullient cheerful and optimistic presence in Brussels whilst the Tories are playing for time and hoping that Mistress Sturgeon will do them the greatest favour by commanding her minions in the Commons to put forward a bill bring about a second EU Referendum! This time, Madame is likely to follow former Prime Minister Harold Wilson’s example in the first EU (then “Common Market”) referendum and allow the cabinet and MPs to campaign as they wish. She is likely to remain silent. As will Comrade Corbyn! The timing of the referendum is critical as it is possible that the referendum result will be influenced by outside events. Following today’s face in Brussels, it is clear that things will come to a head in December. If the talks are stopped then the International Credit Reference agencies will act quickly and decisively to down rate the UK’s credit rating. This will push up debt service costs for the UK public account but also the BofE’s base rate which will increase mortgage and overdraft costs – a lot! It is this action along with a slump in the value of Sterling which will precipitate events. Expect the month of January 2018 to be taken up with the Bill establishing a second referendum. Expect the month of February and the first half of March 2018 to be taken up with the campaign. Expect the vote to take place on Thursday 15th March 2018 – classicists such as Johnson and Rees-Mogg will not fail to notice that this is the “Ides of March”! But then if the idea is the death of British sovereignty then date of the assassination of Caesar is appropriate!